A diverse line-up of professional world-class performers played on two outdoor stages throughout the day on Saturday, July 28: in front of the Fort Langley Community Hall on Glover Road and on the Bedford Plaza boardwalk on Billy Brown Road. From blues to big band, traditional to modern jazz and gypsy to latin jazz there was something for every jazz fan! The WOW Jazz Orchestra was formed in 1997 by Jack Fulton (trombone) and Paul Ruhland (bass), who in addition to their instrumental skills, were also talented arrangers. Heading into their retirement years they decided to write arrangements they could play with their friends and colleagues. The band played a regular Tuesday night gig at the famed Hot Jazz Club until it closed in 2006. Although Paul Ruhland retired from the music business in 2004 (and passed away in 2013) and Jack Fulton retired from the music business when the Hot Jazz Club closed, the band “book” of over 300 arrangements by Paul and Jack remains in good hands under the stewardship of Jack Stafford. The band is comprised of the top experienced freelance musicians in Vancouver whose collective background includes playing music from across the spectrum in thousands of concerts and shows including performances with the Vancouver Symphony Orchestra and the Vancouver Opera Orchestra, concerts with Frank Sinatra, Tony Bennett, Barbara Streisand, Ray Charles, Paul Horn, Kenny Wheeler and Fraser MacPherson and shows such as Miss Saigon, 42ndStreet and the Sound of Music. After a hiatus of several years, the WOW Jazz Orchestra regrouped in 2017 and its ten members once again are providing Vancouver audiences with a dose of swinging and original “little big band” music . 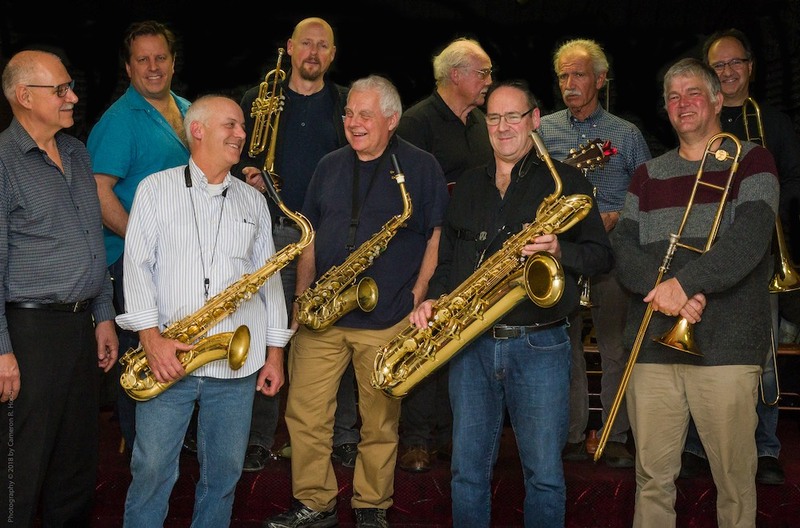 Current members include: Jack Stafford, leader and alto sax; Steve Hilliam, tenor sax; Chris Startup, baritone sax; Rod Murray, trombone; Sharman King, bass trombone; Derry Byrne, trumpet; Tom Shorthouse, trumpet; the legendary Oliver Gannon (recent recipient of the Order of Canada), guitar; Craig Scott, drums and Dave Guiney, bass. Van Django's music is well-rooted in the gypsy jazz of 1930's Paris France, but beyond that it's all pure blue-skying; flights of dazzling fancy, driving rhythms and boundless creativity, featuring original compositions and arrangements including humorous mash-ups wearing their eclectic influences in full regalia. Since the group's formation in 1998, they have toured extensively in Canada as well as international forays to the US, Europe and China. The group has had repeat performances at Djangofest Northwest (DFNW) in 2008-2016 sharing the stage with gypsy jazz luminaries such as the John Jorgenson Quintet, the legendary gypsy jazz guitarist Romane and many others. They have released 4 CD's "Tiptoe Trip”, “Waltz in the Shape of a Tree", “Hotel Europe” and a Christmas CD with special guests titled, “Cool Yule”. They have been well received and played on many radio stations including; CBC, RDI, Espace Musique, NPR and Lyric FM in Ireland CD. The Louie Quinn Band is comprised of established Vancouver jazz and blues musicians Doug Louie on piano, Dave Quinn on clarinet/saxophone, Sam Shoichet on bass and Rob Neumann on drums The quartet is influenced by funk and roots-driven jazz and blues from the 50’s to today. The band is currently working on a new album of original music that drives home the multiple musical influences of the future. They have been performing regularly every Friday at the Revel Room in Gastown Vancouver and every Saturday night at The Royal Castle in New Westminster in addition to performing special events and festivals. A three-time Grammy winner and R&B Hall of Fame inductee, Dutch Robinson is an iconic soul performer and original lead singer of the famed R&B soul sensation, the Ohio Players. Dutch performs regularly with the Louie Quinn band, delivering a powerful, soulful, and heartfelt performance every night with a mix of both classic soul and jazz covers and outstanding originals. He has worked with artists ranging from Cirque Du Soliel, Tommy Motolla, Daryl Hall, John Oates, Melba Moore, Kid Creole & the Coconuts, and Curtis Mayfield. He has also starred in a musical based on the Life and Times of Marvin Gaye and performed at the opening ceremonies of the Winter Olympic Games in Vancouver. Q5 Jazz was originally formed in 2004 by founding members Norm Quinn, Roy Sluyter, and Stan Taylor. Its newest members, Lorne Kellett (replacing Roy Sluyter on piano) Allan Johnston (bass) and Aaron Hardie (saxophones) have been added to this exciting and sophisticated ensemble. All members write and play original and soulful compositions. Q5's music is built on the strong traditions of modern jazz and is molded into their own shape and form. Q5's strength is showcased in their performances, with tight ensemble work, a diverse repertoire, fierce, imaginative soloing and intuitive interaction and in their love of all great music. The City Soul Choir is Vancouver’s go-to soul, gospel, and world music choir, led by renowned composer, director, and music educator, Brian Tate. This exuberant choir performs music that lifts the soul, moves the body, and fills the heart. The CSC draws its repertoire from a wide variety of soulful traditions—R&B, world, soul, gospel, funk, pop, classical, spirituals, and more. Whatever you call it, this choir’s music uplifts, inspires, and transforms audiences. The CSC’s music director and co-founder, Brian Tate, is known for his exciting choral compositions and arrangements, many of which are published and performed worldwide. He is widely respected as an educator, conductor, composer, arranger, and vocalist, as well as for his lively choir workshops, rehearsals, and unique approach to coaching singers. Brian and his wife, Patricia, launched the City Soul Choir in January of 2010 with more than 100 auditioned singers. 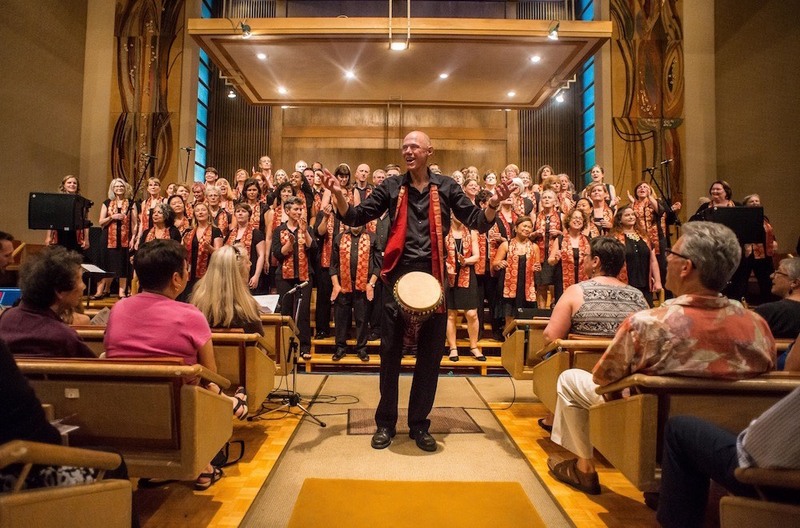 Since then, the choir has become a strong presence in Vancouver’s soul, gospel, and world music choral scene. The City Soul Choir is delighted to welcome renowned local pianist, Bill Sample, as accompanist for this performance. And most honoured to have been invited to be part of the inaugural Fort Langley Jazz and Arts Festival! Murray Porter’s music has an instantly recognizable sound. The Mohawk piano player from Six Nations of the Grand River Territory brings his culture and history to the masses through his music. With a mix of blues, country, and humour, Porter’s gravelly, soulful voice sings not only of the history and contemporary stories of the Indigenous Peoples of North America, but also universal themes of love, lost and found. He has spent over 35 years playing his self-taught unique style of foot-stomping, hand clapping blues piano around the world. It was in 2012 that he won a JUNO Award forAboriginal Album of the Year for 'Songs Lived & Life Played'. Currently, he is in the studio recording his next album of original music titled, 'Stand Up! ', which Murray strongly feels this is his best music to date. This will be released in the late Spring of 2018. His band of amazing musicians include Helene Duguay on bass, Rick Boulter on guitar and Michel Bruyere on drums. Helene is a legendary bass player, who use to play with 'The Beatlettes', an all female pop band in the 1960’s in Montreal. Her life partner Rick Boulter is not only Murray’s guitar player, but also his Producer on his JUNO winning album, and his new album, 'Stand Up!'. Michele Bruyere on drums, also does double-duty as Buffy Sainte-Marie’s drummer. Together these talented players have performed at the Burnaby Blues & Roots Festival, where they wowed the crowd last summer. They also opened for Buffy Sainte-Marie at 'The Drum Is Calling Festival', in downtown Vancouver. One thing’s for sure about this Band is they will have you up dancing in no time. Do not miss their performance! Countless tours, festivals and sold out shows across Canada, the US, Malaysia and Philippines have earned Rumba Calzada the title of Canada's tightest Latin band. Originally formed in 1991 by Boying Geronimo and now headed by his son, Raphael Geronimo, the band has recorded four albums with an array of nominations and awards, including a Juno Award (World Music Album of the Year), Westcoast Music Awards (Outstanding World Recording of the Year) and Independent Music Awards (Best Global Album). With airplay and media praise around the globe, including Montreal, Miami, New York, LA, Columbia, Venezuela, Peru, Malaysia and Manila, Rumba Calzada is gearing up for more tours and recordings, with an all-new album planned for 2018. The Miles Black Quartet features long time musical allies Oliver Gannon (guitar), bassist Jodi Proznick, and drummer Craig Scott. Black and Gannon have performed together for over three decades, beginning with sax legend Fraser MacPherson, then continuing with the Oliver Gannon Quartet (formed in 1991). Their amazing musical chemistry is evident in the many CellarLive albums they have created. Both Proznick and Scott are also members of the current OG4. Also featured at this performance is the up and coming star Julia Copeman-Haynes, whose vocal prowess is undeniable.